Can retail stores sell Thrive products? Selling product in your retail store is no problem. Let me answer some of the questions you might have about selling Thrive though your retail store. 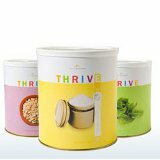 Can I sell Thrive foods through my retail store? Yes. In order to sell Thrive products at a retail store you must become an independent consultant. You do this by purchasing a starter kit and have a Thrive Q set up. As a retail store what price do I buy/sell Thrive products at? As a retail store you will purchase items at the "Q club price" and re-sell it in the store for at least what is called "MAP" pricing. The MAP = The pricing on the Thrive Life website that customers pay if they are not linked to a consultant. As a retail store you can sell for higher than MAP, but not lower. As a retail store/consultant you will also earn host benefits from all of your sales and you can then re-sell that free and 50% off product for MAP (or higher) pricing. This discount can be very beneficial financially IF you utilize the host benefits. Can I sell competing products in my store? Yes. The only restriction is that you cannot sell products from other home party businesses. Can I use the Thrive Life Branding to advertise in my retail store? Yes. Thrive Life provides a marketing kit the can be downloaded for free and then be used to create any promotional materials you need. Thrive life also offers a variety of banner, signs and other marketing materials for consultants to purchase. Are there other retail store selling Thrive Life products? Yes there are store successfully selling Thrive Life products throughout the US and Canada. Many of these are stores serving local markets focused on emergency preparedness, health and nutrition or religious book stores. How do I sign up to sell Thrive products in my retail store? 1) The retail store must purchase a starter kit. These starter kits come with various components such as sampling cans, a Food Rotation System, marketing material, and more depending on the kit you choose. To sign up and purchase a starter kit go to: http://homeparties.thrivelife.com/homeparties/getstarted and click "Start Here"
2) Any product (including those purchased using Host Benefits or party supply benefits) that are sold "cash and carry" must be sold for no less than our MAP price. MAP price is the lowest sale price listed on the website. 3) We do not offer wholesale pricing. Any business wishing to participate in this program must do so using the direct sales platform, which means they buy and sell just like all consultants. 4) You must maintain a monthly auto shipment, also called "The Q" to qualify for the program. We recommend using this for samples in your store. 5) The store may not exceed 2,000 sq.ft. 6) Consultants must fill out the Store Qualification Form and submit it to stores@shelfreliance.com for approval prior to signing up any store. “We have a pawn shop/surplus store with a preparedness section. I stock Thrive. The policy on selling at retail is that you cannot sell for less than the published retail price. There is not a ton of markup from Q price to retail. It is a good deal for individuals because you save money. In a retail environment it is not very much. But there are ways to get a better markup. · By ordering and having my own party, I get the free and half off items as a host benefit and then I can sell them for retail. · Also the UAS (unadvertised specials) are a better markup than Q to retail. · I also add customer orders to my monthly party and get the benefits for that. There is no way to stock everything so I stock popular items and items that I use in my home. I also do what I call Sample Saturdays. The first Sat of every month I sample a few items dry and then cook something so customers can grasp the "its real food" concept. I also sample the instant milk. I put up signs the week before to let everyone know when sample Saturday is going to be and also on my Facebook page for the store." The end of summer is approaching, my kids go back to school next week (Hurray!) and we are getting ready for fall. With the craziness of summer we have relied on eating out of our home store and it is time to stock back up. Luckily Thrive Life (formerly Shelf Reliance) is having one of the biggest sales of the year. You’ll save 20–40% on every THRIVE item featured in this exclusive Home Party sale, plus great discounts on food rotation systems and emergency items. *all sizes are on sale I've listed the #10 can prices. See everything on sale here . 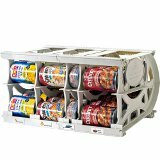 Including the Harvest 51 rotating shelf and solar panel. For all you real nerds here is the breakdown of everything on sale including % off, cost per serving, etc. This sale will last until September 2nd OR go until inventory is gone. Don't wait too long, in the past we've sold out quickly. If you want more information, visit my page about the Thrive-a-ganza Sale. It's been a while since Thrive Life had a great sale, but this is a great one and well worth a look. That's it from me for now. I'm headed off to enjoy the last few moments of summer. PS: For those of you looking to make a large purchase you might want to think about becoming a consultant and earning commission on all of your orders.